Today at the official press introduction of the 2015 Porsche Macan, we learned Porsche's future product plan for their new baby SUV. And it includes electricity, oil burning, and fewer cylinders. Get ready for the variants. At the factory in Leipzig, Germany, where Porsche builds the Cayenne, Panamera, and now the Macan, Porsche Chairman Matthias Müller and Porsche Cars North America CEO Detlev von Platen dropped the following tidbits to us this morning. 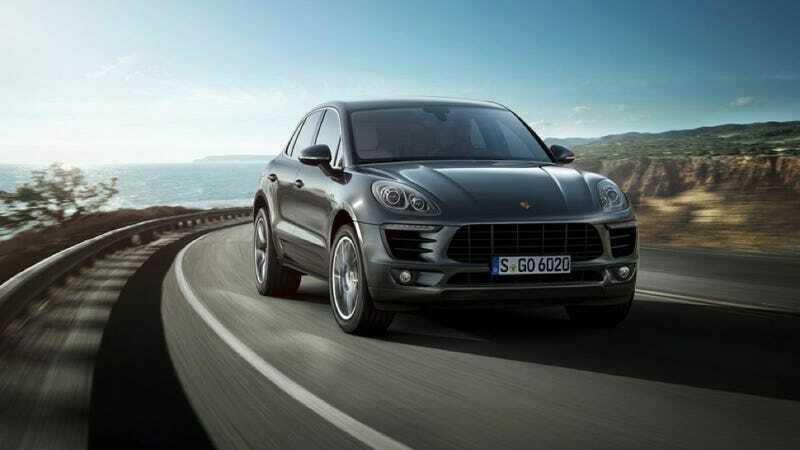 Porsche will be building a Plug-In Hybrid Macan, they say it's their solution to environmental issues. The Macan Diesel will be in the USA from 2015, according to von Platen. That means your Macan can have a 3.0 turbodiesel V6 with 258 horsepower and 405 foot pounds of torque. Acceleration to 62 will be a brisk 6.1 seconds. I drove the Macan Diesel briefly today on an off road course, and it's a torquey little SOB. There will be a four cylinder Macan, because the Chinese market requires it for "legal reasons." No word on if or when that would make it to the USA. Porsche decided to build the Macan in Spring 2011, and in the last three years they have built a new car, a new factory, and hired 1,500 employees to support it. There is the possibility of a car that resembles the gorgeous Panamera Sport Turismo concept to come along as a seventh model for the automaker. Please make that so. They'll be here in May. Start your credit cards. And now you know the rest of the story, Paul Harvey.